Lloyd Square was once part of lands owned by the Knights Hospitallers, later passing to Dr William Lloyd, Bishop of St Asaph's in the time of James II. Comprising 3 large fields, it was part of the dowry of his great-granddaughter when she married Revd William Baker in 1775. From 1819 Revd Baker and his son Thomas Lloyd Baker began to develop 2 of the fields for housing. 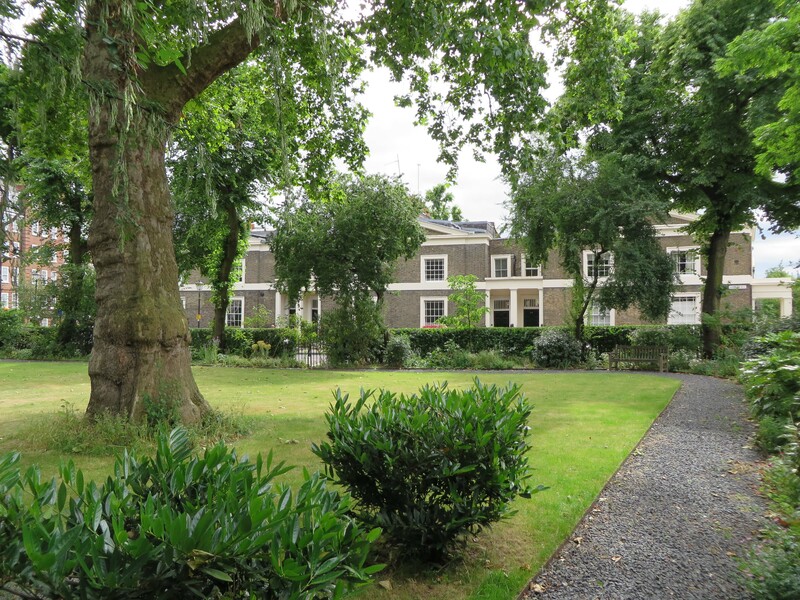 A plan for Lloyd Square was submitted in 1828, having larger houses and a central garden, which since 1917 has been managed by a Garden Committee of residents. The garden's original layout remains relatively intact and has some fine mature trees. A path leads to a pergola and the children's play area was once a tennis court. The sloping site of Lloyd Square was once part of the land of the Knights Hospitallers, which later passed to Dr William Lloyd, Bishop of St Asaph's and one of the '7 bishops' of James II. The estate was part of the dowry of his great-granddaughter Mary, who married Revd William Baker of Hardwicke Court in Gloucestershire in 1775. Their land in London comprised 3 large fields, two adjacent to land owned by the New River, Hill Field containing 2 small reservoirs used by that company and Robin Hood's Field; the third, lower field was Black Mary's Field abutted Bagnigge Wells Road, which had cows and farm buildings and from the 1770s to 1820s had two large tile kilns owned by 2 successive companies who excavated the hillside creating a steep slope. From the early C19th onwards Clerkenwell was becoming more densely populated and from 1819 Revd Baker and his son Thomas Lloyd Baker developed two of their fields for housing, the first houses built in what is now Lloyd Baker Street, originally called Baker Street. The estate plan was drawn up by the family's estate surveyor John Booth and his son William Joseph Booth who took over as architect. Booth's houses have been described as 'extraordinarily individual' and there were disputes with neighbouring land-owners such as the New River Company and Northampton Estate. A plan for Lloyd Square was submitted in 1828, situated between Amwell Street and King's Cross Road and having larger houses and a central garden on the hilltop; it was laid out by c.1833. Surrounding houses were built c.1832 and the cast-iron railings around the garden square are early C19th. A small circular pond that was one of the New River reservoirs in Hill Field was situated below the north-west corner of Lloyd Square; later drained and built on, it is now the site of Archery Fields House. The estate was owned by the Lloyd Baker family until the mid-C20th. Unlike Granville Square (q.v.) Lloyd Square was not part of the estate acquired by LB Islington in 1978 following the death of Miss Olive Lloyd Baker in 1975, and remained as leasehold with the gardens in private ownership and maintained by a garden committee through a rate levied on the residents. A Garden Committee run by residents has managed the garden since 1917. The layout remains relatively intact, including its path layout, and there are some notable mature trees. Since 2000 renewal work has taken place to renovate the railings, reinstate paths and provide new planting, including refurbishment of the arbour in 2008. A central flowerbed is surrounded by smaller beds planted with roses and perennials, and there is a traditional herb garden. A gravelled path leads to a pergola and the lawned children's play area was originally laid out with a tennis court. No. 7 Lloyd Square was established in 1866 as a House of Retreat for the Society of Sisters of Bethany, the convent converted in 1962 into the YWCA. Mary Cosh, The Squares of Islington Part I: Finsbury and Clerkenwell, London, 1990; Ben Weinreb & Christopher Hibbert, 'The London Encyclopaedia' (Macmillan, revised ed. 1993); Michael Waite, John Archer, 'Nature Conservation in Islington', Ecology Handbook 19 (London Ecology Unit), 1992; Bridget Cherry & Nikolaus Pevsner, The Buildings of England: London 4: North (Penguin, 1998).